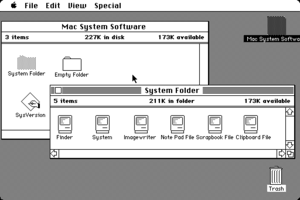 Classic Mac OS is characterized by its monolithic design. Initial versions of the System Software run one application at a time. System 5 introduced cooperative multitasking. System 7 supports 32-bit memory addressing and virtual memory, allowing larger programs. Later updates to the System 7 enable the transition to the PowerPC architecture. The system was considered user-friendly, but its architectural limitations were critiqued, such as limited memory management, lack of protected memory and access controls, and susceptibility to conflicts among extensions. Star Trek (as in "to boldly go where no Mac has gone before") was a relatively unknown secret prototype beginning in 1992, whose goal was to create a version of the classic Mac OS that would run on Intel-compatible x86 personal computers. In partnership with Apple and with support from Intel, the project was instigated by Novell, which was looking to integrate its DR-DOS with the Mac OS GUI as a mutual response to the monopoly of Microsoft's Windows 3.0 and MS-DOS. A team consisting of four from Apple and four from Novell was able to get the Macintosh Finder and some basic applications such as QuickTime, running smoothly on the x86 architecture. The project was canceled a year later in early 1993, but some of the code was later reused when porting the Mac OS to PowerPC. In recent years, Apple has also launched several new operating systems based on the core of macOS, including iOS in 2007 for its iPhone, iPad, and iPod Touch mobile devices; watchOS in 2015 for the Apple Watch; tvOS in 2015 for the Apple TV set-top box; and audioOS for HomePod smart speakers. ^ Gruber, John (January 21, 2009). "Three things OS X could learn from the Classic Mac OS". Macworld. Retrieved September 13, 2016. ^ Siracusa, John (March 24, 2006). "Five years of Mac OS X". Ars Technica. Condé Nast Digital. Retrieved April 15, 2009. Even Steve Jobs still says "ecks" instead of "ten" sometimes. ^ a b Gruber, John. "Mountain Lion". Daring Fireball. Retrieved 15 August 2015. ^ Honan, Matthew (January 9, 2007). "Apple unveils iPhone". Macworld. Retrieved January 16, 2010. ^ a b Linzmayer, Owen W. (2004). Apple Confidential 2.0. No Starch Press. ^ "A Brief History of the Classic Mac OS – Low End Mac". ^ "What is an operating system (OS)?". Apple, Inc. 2004-07-15. Archived from the original on July 22, 2010. Retrieved September 6, 2014. ^ "macOS version 10.12 Sierra on Intel-based Mac computers". The Open Group. Retrieved September 29, 2016. ^ Apple Computer (December 20, 1996). "Apple Computer, Inc. Agrees to Acquire NeXT Software Inc". Archived from the original on January 16, 1999. ^ "Apple Releases Developer Preview of Mac OS X Lion". Apple. Retrieved February 24, 2011. ^ Crabb, Don (10 August 1992). "Apple finally gets Unix right with A/UX 3.0". InfoWorld. pp. 68–69. ^ "MAE screenshots". Archived from the original on January 24, 2014. Retrieved March 4, 2015. ^ Barbou des Places, François; Stephen, Nick; Reynolds, Franklin D. (January 12, 1996). "Linux on the OSF Mach3 microkernel". Grenoble and Cambridge: OSF Research Institute. Archived from the original on February 11, 2012. Retrieved April 4, 2013. ^ Hormby, Tom (2005). "Star Trek: Apple's First Mac OS on Intel Project". Retrieved November 10, 2015. ^ Linzmayer, Owen W. (1999). Apple Confidential. San Francisco, CA: No Starch Press. ISBN 9781886411289. OCLC 245921029. Retrieved May 29, 2017.